Take control of your destiny! The bottom line? You want to be successful in the self-storage business. 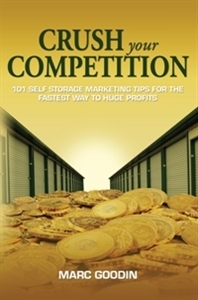 This book will give you the ammunition you need to make incredible profit, whether you’re an entrepreneur, professional, self-storage owner or manager, or an absolute newcomer to the business. The author will show you how to use simple marketing tactics and ideas with minimal cost and maximum earnings. Marc has learned about self-storage and marketing from real-life experiences. After reading hundreds of marketing books full of general theory, he decided it was time to put his perspective from the trenches into a book for other industry owners and managers.